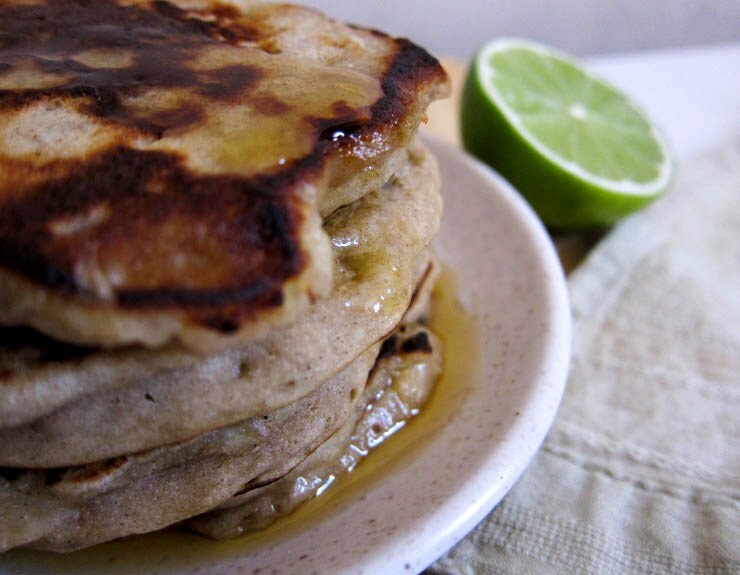 vegan and gluten-free banana lime buckwheat pancakes. Bananas are cheap again. It's funny, the way price affects how I treat my produce. Now that they don't cost a fortune, I'll buy a bunch and leave them lying around the counter for days, giving them nary a thought. Over time, they start softening, collapsing in a sweet surrender, the yellow skins darkening with an increasingly relentless influx of brown spots. And then I look over one day and think, oops, perhaps I should start using them before they go bad. So that was how it came to be that I made these vegan and gluten-free buckwheat banana-lime pancakes three times in a row. There are slight differences in the flavours and textures each time I make them, depending on how ripe the banana is, and how thoroughly I mash them. Invariably, however, they tend to end up tasting like juicy banana bread in pancake form, and you can't go wrong once you give them a good slosh of maple syrup - the magical finishing touch. Mix buckwheat flour, baking powder and salt in a bowl, form a well in the middle, and set aside. In another bowl, mash up banana flesh with lime juice (and zest, if using) with a fork until mushy, then stir in soy milk and oil. You could also use a blender or food processor for a smooth texture, but I like it the rustic way. Pour the banana puree into the well of the first bowl, then stir gently with a wooden spoon until just combined - do not overmix. At this point, the batter should be thick but still pourable, with a slightly lumpy appearance, resembling a porridge. Heat up a well-oiled frying pan over medium heat. Drop 1/4 cup of the pancake batter into the frying pan and cook for approximately 1 minute and 30 seconds to 2 minutes, or until the edges set and bubbles pop on the surface. Turn and cook the other side for 30 seconds to 1 minute until golden, then flip onto a plate. Repeat with the remaining batter. You should end up with 4 fat pancakes. Serve with lashings of maple syrup and lime wedges to squeeze. gluten-free and vegan buckwheat banana-lime pancakes in a sinful maple syrup bath. Finally an interesting use for the buckwheat flour I have stored away in the freezer! Thanks! Never had lime on a banana pancake but I'm willing to give it a go! They look really good. I love buckwheat and these pancakes look appropriately decadent. My only trouble is that bananas seem to evaporate in this household, I never have overripe ones lying around. I see you operate more efficiently than I do! We had a family friend when I was growing up into health foods (a big deal in the 80s...) we called him 'Stan, Stan, the buckwheat man' he would havae loved these. Me too! Such a cool idea. I know what you mean about letting fruit to sit there for too long once you can actually get it - I'm like that with avocados. To be fair, it's so hard to know when they're going to deign to ripen perfectly. I do have some buckwheat flour kicking round, so I'll look out for bananas next time they're on special and give these a go! Oh yes, those dastardly tricky avocados! I hear you! I treat my fruit and vegetables the same way. These look lovely. Your MIL's recipe sounds tempting! I can imagine your banana-lemon-honey combo tasting great too. I hardly associate banana and lime in a single dish but you just seem to make it work! Oh, why no pancake love for so long? One day, one day soon! It's time to rejoice for the price of bananas have finally gone down again, yahoo! Last week, I went to the market and got a bunch for 50cents/kg, it's insane. I immediately baked myself some banana bread that night. Now, I'm thinking I need to make another trip back so I can give your banana pancakes a go! My usual pancakes are quite plain and boring and that's why I like how you've added ingredients like lime zest and soy milk, yum! That's a bargain! Gotta love banana bread... yum yum yum. Just the words "banana lime" sound heavenly! So, this is a 'must make' recipe for me and my hubby over the next few days - that's for sure! Lime on bananas? How curious! Love the idea though, sounds quite zesty! Hehe yes they used to be like gold. You'd ceremoniously unwrap it and savour every bite! Now they're everywhere for $1.50 a kilo! Oh yes, so precious! I'm so glad they are affordable again. My husband is a banana bread lover so I know he would love these! Yayy for cheap bananas! That reminds me, I have two semi black bananas in the freezer.. now to do something with them! These pancakes look seriously delicious - I love the flavour combos and buckwheat? Sounds totally yum! Such a lovely recipe... I just posted a buckwheat pikelet recipe today too. Love yours... sublime! Mmmm! We are giant fans of buckwheat pancakes in this house. I like the addition of lime instead of lemon - nice twist! I do love my lime. We use lime more often than lemons back home in Malaysia. This looks like a pretty healthy stack of pancakes and I think that twist of lime really gives them a new taste dimension. I did see bananas selling for $2 a kilo at Harris Farm a few weeks ago. I adore the lime in this recipe... I've been wanting to experiment more with buckwheat on behalf of my gluten free clients and this is just the inspiration I needed! A great way to use buckwheat. 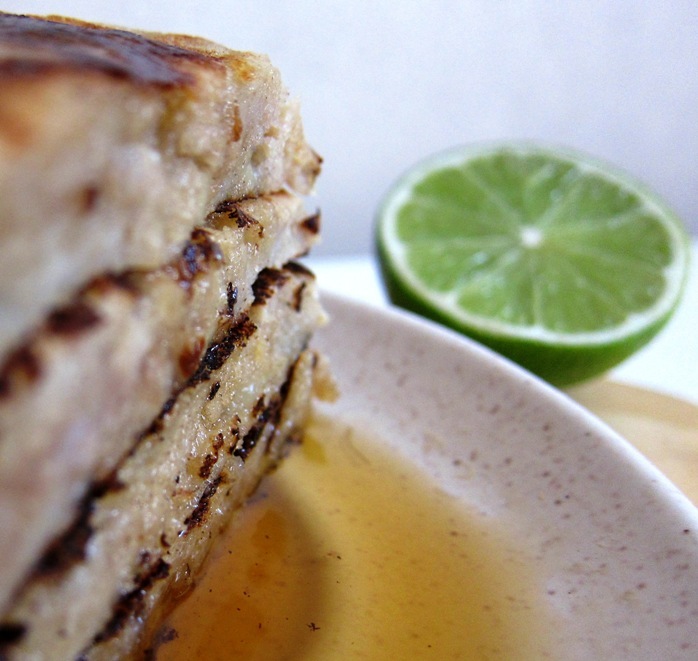 I love pancakes and maple syrup - a perfect breakfast idea, especially the touch of lime - thanks for sharing! That is so healthy and delicious! These look simply delicious! I have never tried buckwheat, but sure will! buckwheat and lime and banana is a new combination to me! Definitely trying this out as I was a bit put off by the taste of buckwheat pancakes plain the first time i made them.